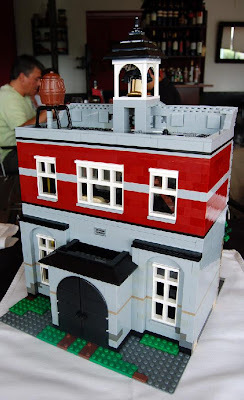 Brick Town Talk: More Great Pictures - LEGO Town, Architecture, Building Tips, Inspiration Ideas, and more! 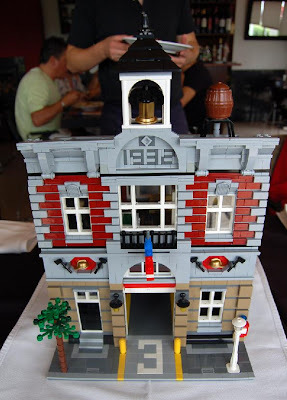 This is the 10197 that LEGO send to my LUG (Comunidade 0937) to present in our event at Tomar, Portugal (11 to 14 of June). This photos were taken last weekend on a small meeting. 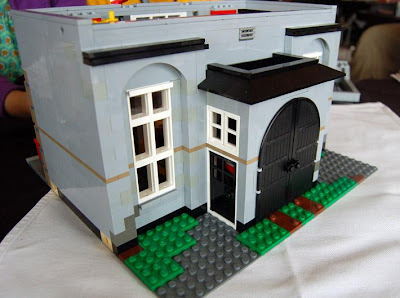 Some parts (like bricks corner 2x2 in old gray and dark bley) had been substituted because there were missing. OMG ! Until I saw these close-up images, I thought the golden bell was a new unique part :) It's very creative regardless and the set is a definite win in general. I'm glad there are windows on the back of the building. I wasn't expecting that much detail. Very well done TLG ! This new building looks great. Happy that Lego start making so great and detailed sets finaly. Some people are saying that it doesn't match the european style of the others. Why did you choose this design style? Any other comments from him would be fantastic as well.